What Shell Says - A Manchester Beauty, Fashion and Lifestyle Blogger: A Few Monday Beauty Buys! A Few Monday Beauty Buys! I'd been debating investing in some MAC make up brushes for a while but unless I decided to take out a bank loan or won the lottery I just couldn't bring myself to pay the small fortune it would cost. And then I saw a review of Real Techniques brushes by the lovely Julie over at http://justjulie81.blogspot.co.uk .......my mind was made up, I was going to buy these!!! So today I ordered the Starter Set from Amazon UK for just over £16 with free delivery. This set is also available to buy in Boots but I thought I'd save myself a few pounds and order it from Amazon. I can't wait for them to arrive and try them out! Keep your eyes peeled for a post soon! 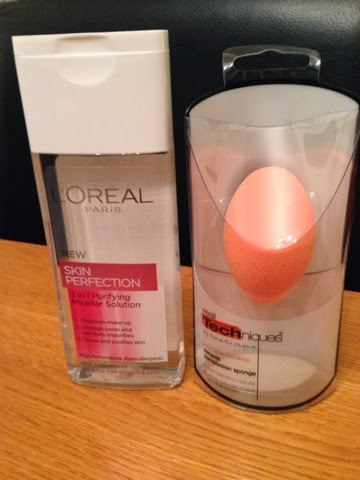 L'Oreal Skin Perfection Purifying Micellar Solution (wow that's a bit of a mouthful!) currently on offer for £3.33. I've seen a couple of good reviews about this and wanted to try it out myself so I couldn't resist picking it up when I saw it was on offer. I normally use Liz Earle Cleanse & Polish as a cleanser and make up remover but I wanted to try something different to remove my make up first before cleansing so I'll see how this goes and will update you soon! I also picked up the Real Techniques Miracle Complexion Sponge in Boots for £5.99. I normally use a foundation brush to apply my MAC Studio Fix Fluid Foundation but I've seen rave reviews about this little sponge and seen a couple of YouTube videos and it seems to make your foundation look absolutely flawless so I'm looking forward to trying this one out! Again, I will do a post in the near future and share my thoughts on this with you. Well, that's all for tonight! Have you used any of these products? Let me know what you think! Great pick me up huni! My First 'Love Me Beauty' Box!